Marinara sauce, from fresh off the vine tomatoes, is one of my favorite cooking projects of the summer. On their own, sun ripened tomatoes are one of the sweetest treats of summer. If you grow tomatoes, receive them as gifts, or can’t stop bringing them home from the farmers market, you probably want to find a way to preserve their splendor for later in the year. The easiest way to make homemade marinara sauce you’ll ever find. Preserves fresh tomatoes and summer vegetables to enjoy all year long (tastes so much better than store-bought tomato sauce). 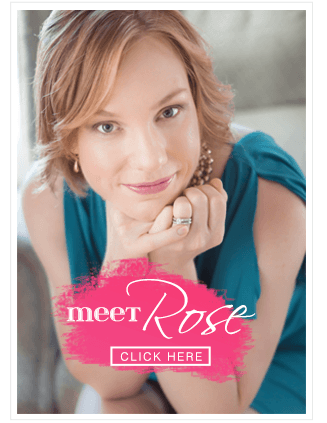 Vegetarian, gluten-free, packed with vegetables, and around 50 calories or 1 Weight Watchers Points Plus per serving. 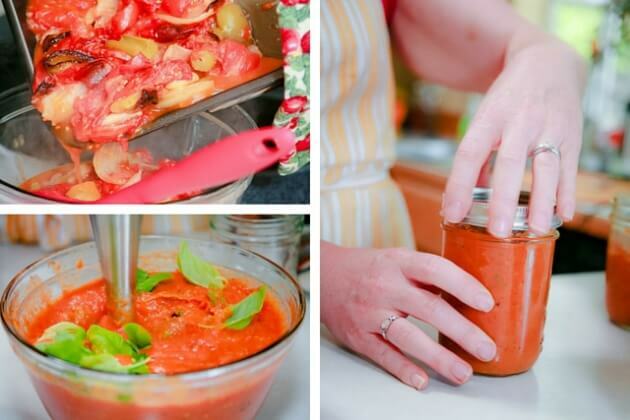 Oven roasted tomato sauce could not be easier! Everything goes into a roasting pan. That’s right! One pan, minimal chopping, no simmering, no straining, and your house will smell like you have a Noni (Italian grandma) captive in your kitchen. Best of all you can portion the finished sauce into containers to freeze or make it pantry (and gift season) ready by following proper canning procedures. A few years ago, my novice attempts at vegetable gardening produced more than I imagined. In a matter of days, my kitchen filled with tomatoes and then fruit flies. Following my family tradition of gardening and preserving I stepped into the world of canning and have not looked back. My mom planted raspberries and a few vegetables in the backyard of my childhood home. The vegetables were very stubborn and rarely produced anything of notable size. The raspberries, on the other hand, were delighted with their location and produced pints of melt-in-your-mouth thimble shaped berries. At the peak of their season it didn’t take long to pick enough berries to make a batch of jam. Every summer my mom turned strawberries, blackberries, prunes, and apples into sweet spreads we enjoyed all year long. I loved watching my mom set up the kitchen for jam making. She had gigantic pots and strange tools that only came out of the basement for this specific task; they seemed mysterious and wonderful. On what were inevitably the hottest days of the year we mashed, sugared, boiled, and preserved the flavor of summer into sparkling jars. Later in the year when we broke the seal on a new jar of jam it smelled like those hot summer days and felt like magic. Shortly after raspberry season ended tomato season began. My grandpa was something of a tomato whisperer. While the days were still dark and soggy, he started his tomato plants on a, newspaper covered, ping-pong tabletop. By the time late summer arrived the plants were heavy with fruit in his backyard. My sister and I had free rein to pick all the bright red cherry tomatoes we could stuff in our cheeks. We learned how to eat to keep the juicy seeds from squirting out of our mouths, then we learned how to aim. The skin on Grandpa’s tomatoes had a powdery roughness I never noticed on the ones we bought at the grocery store. They smelled like soil and hot hose water but tasted like candy. A few years ago I started my own vegetable garden. The first year I planted a modest number of tomato starts but the summer was cool and very wet. We didn’t get to pick anywhere near the number of bright red cherry tomatoes I envisioned. By October I was coaxing green tomatoes to ripen in paper sacks all around the kitchen. The next summer I played the odds and planted significantly more tomatoes. I hoped more plants would mean more ripe fruit, even if the weather refused to cooperate. However, the weather did cooperate. 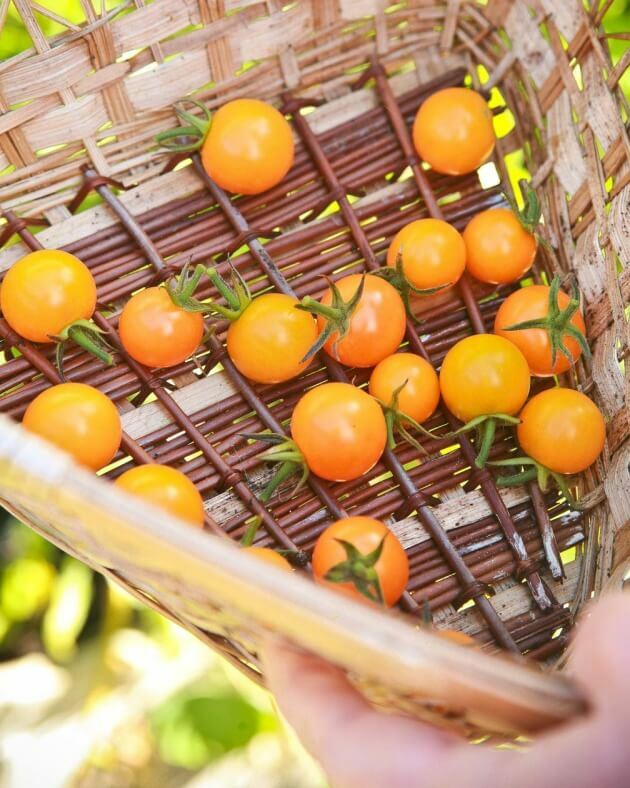 Before I knew what hit me I was harvesting baskets full of full size tomatoes along with bite sized Cherry and yellow Sungolds. The tomatoes I grew had the same rough skin and earthy smell I remembered from my grandpa’s garden. My son ate them like candy, but he has yet to master aim. It wasn’t long before the harvest outpaced our appetite. I had never made sauce from fresh tomatoes but I certainly knew it was possible. I thought about my mom and her jams and realized as much as I wanted to capture the flavor of summer, I did not want to tend a pot of splattering sauce. While combing the internet for inspiration I came across a reference to oven roasted tomato sauce and knew I had to give it a try. Within minutes of sliding the roasting pan into the oven our house smelled like the heart of Little Italy. Oven roasted marinara sauce is so simple, the ingredients are adjustable, and best of all making it does not require standing over a hot stove in the middle of summer. On my first attempt, I accidentally cooked the sauce too long and made the most amazing thick spreadable paste. It was the perfect base for homemade pizza. That first year, I froze the sauce is small portions. 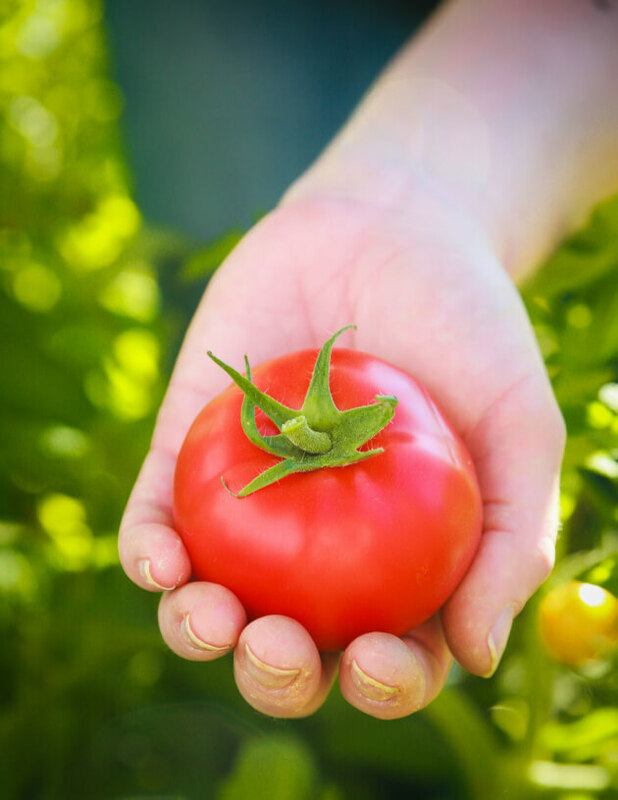 My family enjoyed the flavors of fresh tomatoes and garden vegetables well into spring. The next year, I planted even more tomatoes and decided to try canning the tomato sauce. By that time had my own supply of mysterious oversized pots in the garage. Canning meant standing over a hot stove in the middle of summer but, the dozens of jars on our shelf were well worth the perspiration. Additionally, homemade marinara sauce made lovely holiday gifts. Growing tomatoes feels like coming full circle. My children get to experience the joy of eating the sun ripened fruit straight from the vine and, by making marinara sauce, I am carrying on the tradition of preserving the best of summer in our pantry all year long. Oh, and, this summer I planted a few raspberries, so stay tuned! 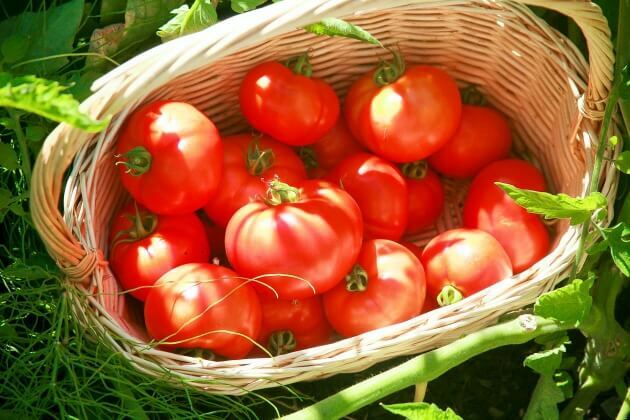 No need to stand over a bubbling pot to make a winning garden fresh tomato sauce to be enjoyed long after the harvest is complete. Oven roasting intensifies the flavors and your house will smell like an Italian grandma has moved into the kitchen! Spread the finished marinara sauce on bread, pour over pasta, use it as the base for pizza, or thin with a little stock and turn it into a soup that take you straight back to summer in an instant. 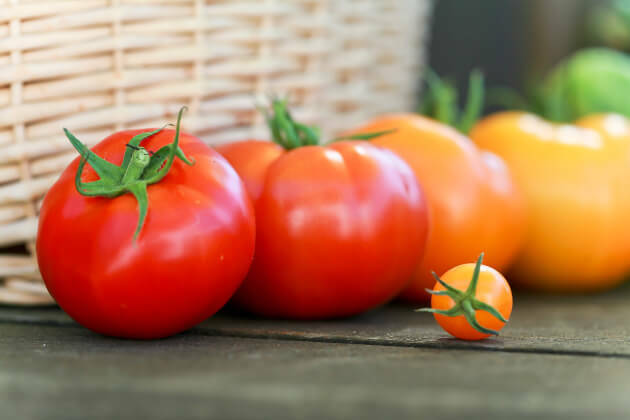 Meatier tomatoes preferred but any peak of season tomato will work - try a blend of varieties - you can even toss in a few green ones at the end of the season. Chop the vegetables into large pieces and arrange them in a single layer in a large roasting pan with the garlic cloves. Sprinkle over the salt and chili flakes. Drizzle olive oil over everything, give it a gentle stir then place the pan in the hot oven. Roast vegetables for approximately 1 hour. The vegetables will reduce and the liquids will bubble. Remove when the vegetables have begun to caramelize (turn deep brown) around the edges. For a thicker sauce leave in the oven until most of the liquid has cooked away. 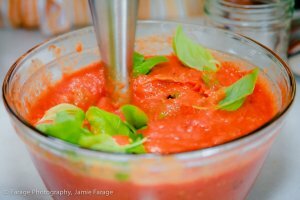 Allow the vegetables to cool slightly before adding the whole basil leaves and pureeing everything into sauce either in a standard blender or with an emersion blender in a large heat safe bowl. Use immediately or allow the sauce to cool and portion in to freezer safe containers to store for up to six months. This sauce can be shelf stable when canned using proper safe canning procedures. If you prefer a thinner sauce roast for less time. 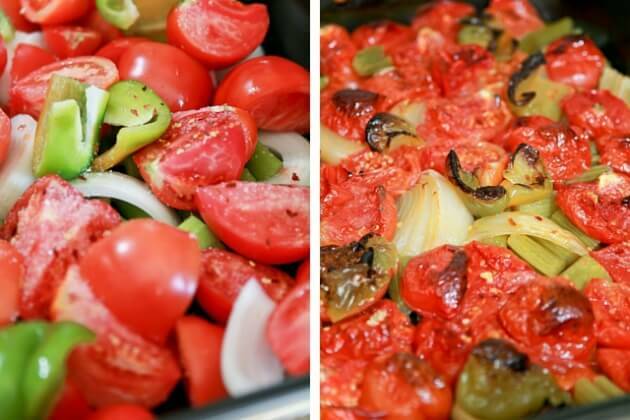 For a heartier sauce (great for pizza) roast the tomatoes longer. 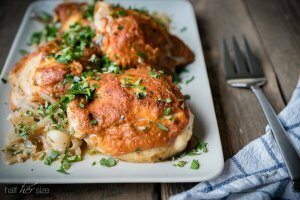 Easiest Baked Chicken with Oven Roasted Marinara Sauce. first try…I burnt mine but I was able to scrape the veggies off and still used my immersion blender…..SO yummy!!! Can’t wait to try again. This is my absolute favorite way to make tomato soup! So much flavor and it couldn’t be easier. The roasting really concentrates the tomatoes and the sweet onions balance the acidity. Perfection! !